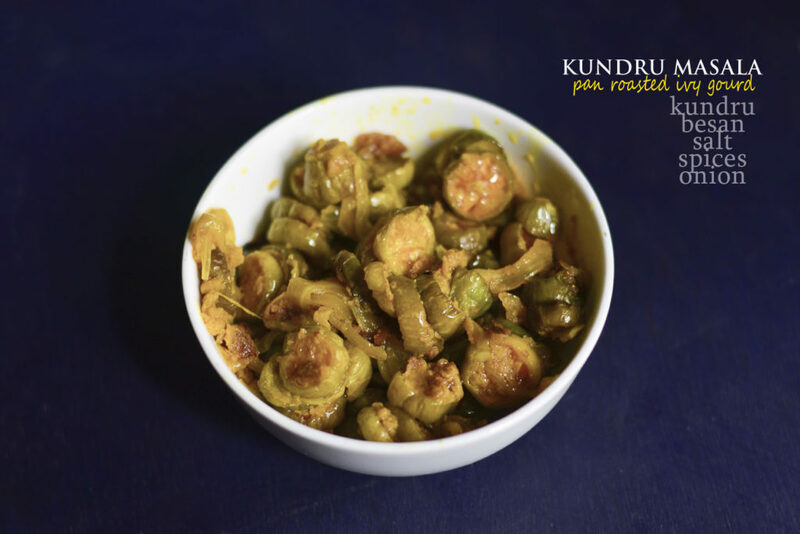 Kundru | Masala Kundru | Kundru Masala with chickpea flour | Pan roasted Ivy Gourd is a delicious recipe made with chopped or slit Ivy gourd better know as Kundru coated with chickpea flour and seasoned with some lovely spiced ,pan roasted with onions. A very simple to cook recipe served as a side dish. Its is gluten free and vegan recipe. 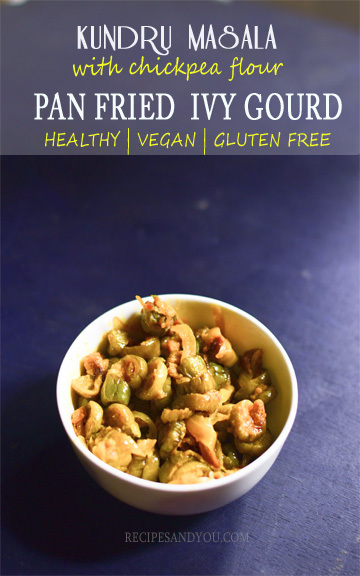 Kundru Masala or Pan roasted Ivy Gourd with chickpea flour is a very popular vegetable from southern India. But this rich in flavor and very healthy vegetable makes its presence in many states in India where its called with its respective names.Like in Kerala its a part of their menu and in Malayalam its called “Kovakkai” .In west Bengal its popular as “Kunduri “.In Tamil,they call it “Kavakka” and so on.Bengali’s make a very Kundri Posto. Likewise, “Kundli” in Assam, “Tondekayi” in Kananda and “Tendli” in Konkani, are the many names its called with and holds a special place in different cuisines. Kundru is a very healthy vegetable and traditionally also used as a medicine to treat many illnesses. Wow! It helps to reduce blood sugar, so its a boon for diabetic patients. Its a very good source of Iron ,vitamins and minerals.So much for such a humble looking vegetable. You will find many recipes across the net, if you find how to cook Kundru /Ivy Gourd. With its multi-cultural presence, it also served in a variety of ways to give you diverse flavors ,so you have a very versatile veggie at hand. 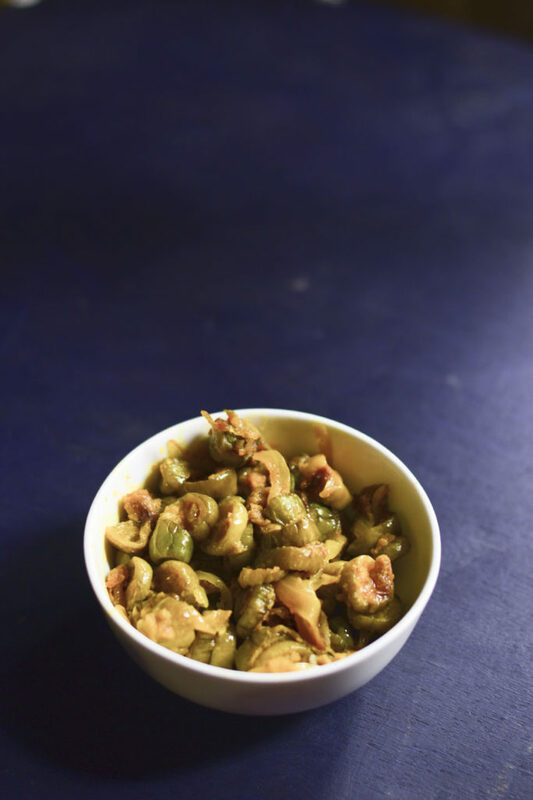 Kundru with chickpea flour ,is a simple recipe wherein we first fry the onions ,the pan fry the kundru and then add the chickpea flour mixed with all the spices and salt to it. Cook it /pan roast it until its crispy and cooked well. 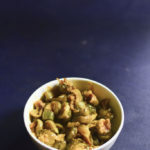 Masala Kundru/ Kundru Masala with chickpea flour / Pan roasted Ivy Gourd is a delicious recipe made with chopped or slit Ivy gourd better know as Kundru coated with chickpea flour and seasoned with some lovely spiced ,pan roasted with onions. In a small bowl, mix all the spices with the flour /besan and keep aside. Heat oil in a deep pan/ wok/kadai. Add the onions and pan fry till golden brown. Now, add the kundru and pan fry them open till soft and almost done. Now, add the besan and spice mix and mix well. Cover and cook for 5 minutes.Then open the lid and roast them till all the water has dried and its a bit crispy. Cook the kundru well before adding the spice and salt mix. Kundru has a lot of water content so its important to let the water dry before adding the salt.Other wise it may become very soggy.